Rick Porcello ends a four-game losing streak with his first win since June. BOSTON — Rick Porcello wasn’t getting carried away after ending a four-game losing streak with his first win since June. The reigning AL Cy Young winner knew he had plenty of help as Boston tagged Chicago for 15 hits and the Red Sox beat the White Sox 9-5 on Thursday night. “We’re swinging the bats well. We’ve got to continue throwing the ball well. That’s the recipe right there,” said Porcello, who survived a rough stretch in the second and third and pitched into the sixth. Porcello (5-14) was winless in his last six starts, losing four straight before the Red Sox capitalized on the White Sox’s woes with seven runs in the first two innings. He allowed five runs and seven hits and struck out six in 5 1/3 innings. 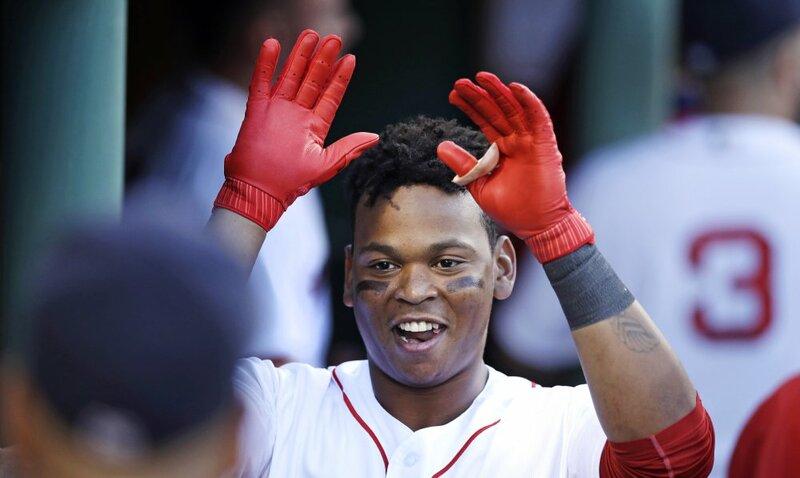 Rafael Devers hit a three-run homer in the first inning for Boston and Mookie Betts added a two-run shot in the second. Andrew Benintendi went 3 for 3, scoring twice and driving in a run as the Red Sox won their third straight. Benintendi reached base all five times he batted, getting hit by a pitch and walking once to go along with two doubles and a single. Nicky Delmonico hit his first career homer, a three-run shot in the third, for the White Sox. Chicago lost its third straight and fell to 3-15 since the All-Star break. The White Sox did manage to turn around the early rout and kept pressure on Porcello. The fast start was enough to help Porcello end a skid of going winless in his last six starts won for the first time since the Red Sox beat the Angels on June 23. Benintendi, who sat out the last two games, surged out of an 8-for-54 slump with a ground-rule double to the triangle in center field in the first. Miguel Gonzalez (5-10) hit him with a pitch in the second, followed by a leadoff double in the fourth and an RBI single in the fifth. Benintendi’s single to right in the fifth drove in Mitch Moreland, who doubled to lead off the inning and added an RBI double in the sixth to put Boston up 9-5. Boston got to Gonzalez right away with four runs and four hits, including Devers’ three-run homer to center. After Chicago got two runs back in the second to cut the lead in half, the Red Sox struck again for three in the third. Betts hit a two-run homer and Hanley Ramirez beat out an infield single, allowing Benintendi to score by sliding around Omar Narvaez’s tag at the plate. Delmonico, who singled and scored in the first, belted a shot out to right with two on in the third for his first career homer. “I went too fast running the bases and didn’t really register that I did it, but it was awesome,” said Delmonico, who made his big-league debut Tuesday and was playing in just his third game. Gonzalez threw 53 pitches without making it out of the second inning. He allowed seven runs, seven hits and hit a batter, before he was replaced by Gregory Infante with two outs in the second. “They capitalized early and hit every single mistake,” Gonzalez said. NOTES: Benintendi acknowledged that the time off, two games plus a rainout Wednesday, probably helped him clear his head a little. “I know there’s a book on me and I’m trying to figure out what it is. It goes both ways. I’ve got a scouting report on the pitcher, so it’s kind of a game,” he said. “It’s always going to be changing, so you just have to adjust.” …. Boston has won three straight for the first time since winning six in a row from June 29-July 4. Despite a shaky July, the victory Thursday combined with Cleveland’s win over the Yankees gave the Red Sox a two-game lead in the AL East. “We haven’t been playing as well as we know we’re capable of playing. Hopefully our best baseball is in front of us right now,” Porcello said. … RHP Joe Kelly (strained left hamstring), on a rehab assignment with Triple-A Pawtucket, could be activated on Saturday, Manager John Farrell said.